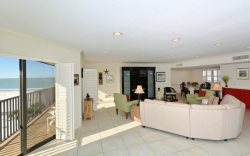 A beautiful location with comfort and convenience of a pool and the beach. Perfect for families! The front desk ladies were very friendly and helpful during the check in process. The maintenance gentleman was very helpful getting our cars back in driving condition after we had an minor accident. El Presidente and Siesta Key never disappoint. We had a fabulous vacation and will be back. Staff members are excellent and work very hard to insure guests have an enjoyable stay. Property is in great condition and units are very well maIntained.